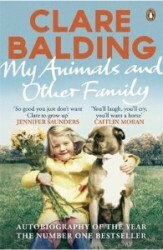 Clare Balding’s family was larger than most. Not only was there her brother, mother and champion-trainer father, but also racehorses, mares, foals, ponies and an ever-present pack of boxers and lurchers. In this unforgettable memoir, she shows how they taught her everything she knows about life, love, joy and sadness. Anyone who loves horses and dogs will simply be charmed by this book. The titular animals are her dogs and horses (the estate of Gerald Durrell approved the title of the book) and her recollections are tender and moving (even to someone who grew up in a London flat and whose only pet was a emotionally disturbed rescue cat). And the pictures are lovely - especially the one (pre Health and Safety days) of the two-year-old Clare high atop Derby winner Mill Reef. a witty, well-written and clear-eyed childhood memoir. she has written a memoir of her youth and, needless to say, it's brilliant... What could have been a dull stroll round a Berkshire pet cemetery turns out to be a gallop through all the most powerful human emotions.